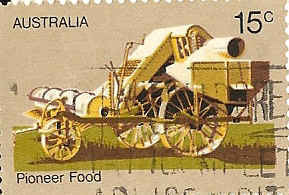 Agriculture has been tried in the Flinders Ranges on several occasions. It has been successful in some isolated areas on a number of occasions but for most of the time agriculture has been a disaster. In an effort to master the land and with little knowledge of the climate, farmers not only ruined the land but also their own economic viability and that of the pastoralists who had previously established succesful holdings. Deceived by several years of excellent rainfalls and believing that 'rain would follow the plough', farmers went beyond the safe agricultural areas. When agricultural land became scarce in the settled districts, combined with the good seasons and crops during the early 1870s, the government decided to disregard Goyder's Line and allow farmers to buy land north of it. Since the passing of the Strangways Act in 1869, buying land on credit had made it much easier for farmers to take up land. More rains fell in April 1873 cheering and comforting hopes for a favourable wet season with plenty of fresh feed. Because of these good seasons, memories of the drought slowly faded and many people again believed that the drought had been the exception rather than the rule. Some even wondered whether Goyder's rainfall line had ever existed. Many farmers started pushing for more land to be opened up for growing wheat. They wanted agricultural areas surveyed to make the north their home to settle down with their families. They argued that there was a lot of good land among the hills and plains that would grow almost anything if cultivated. Numerous petitions were signed and presented to parliament in the hope of amending existing land laws. Others who pushed for the opening up of more land from Pekina to Blinman and beyond, said that there were many thousands of acres where in ordinary seasons heavy crops of hay and other produce could be grown. Some ways to solve these problems was to make land available on credit and start building a railway north from Port Augusta and setting aside large farms on both sides of the line. There was even talk of the government to establish a research station at Government Gums, later renamed Farina. Wheat was even grown as far north as Dalhousie Springs, just south of the Northern Territory border. Finally the government decided to disregard Goyder's Line in November 1874. Obviously it expected a substantial increase in revenue from land sales. After cutting up some of the large and successful pastoral properties for agricultural blocks, it expected a large increase of population. To cater for it many new towns were surveyed. Among them were such places like Pekina, Orroroo, Wilmington, Hammond, Bruce, Cradock, Gordon, Johnburgh, Wilson, Carrieton, Chapmanton and Amyton. For several years it looked as if Goyder had been wrong as rain just kept on falling every year. During the winter of 1882 it looked as if 'the rain did indeed follow the plough', when a local correspondent reported that 'About seven miles north-east of Blinman are several farms which, last year, notwithstanding the unfortunate season, yielded 15 cwt. of hay to the acre, for which $24 per ton was obtained, and I am told that several more farmers are likely to at once settle in the district'. He went on to predict that 'Hay will always realise a high price here so long as a limited quantity is grown, as the heavy charge for carting from Parachilna will render competition from down south impossible'. Blinman had become 'the garden of the north' with valleys and hills covered with splendid herbage. The good feed, the growth of which was 'perceptible to the naked eye' seemed to be everywhere. By the end of 1883 farmers could not believe their eyes. The good feed had gone, and Blinman, which had a year before been called 'one of the healthiest places in South Australia' was now nothing more than a dustbowl. It had experienced one of the worst droughts for twenty years, affecting the country between the Flinders Ranges and Lake Torrens. For more than three hundred kilometres not a blade of grass was to be seen. By the start of 1884 stock losses had been substantial. Fortunately splendid showers fell in March. In fact enough rain fell to wash away the railway bridge embankment just north of Quorn and cause the Willochra Creek to flood an area of thirteen kilometres wide. That same rain also caused the flooding of creeks near Oratunga, delaying the mail from Parachilna for Blinman. In October farmers recorded nearly four centimetres of rain and as a result expected a harvest of about half a ton of hay per acre. They were more than just disappointed. The 1884 harvest was an utter failure and the end of another desperate venture that had gone wrong. It was the last of the good rains for a long time. The very poor seasons of the remainder of the 1880s proved that George Goyder had been right after all, and farmers, many of them financially ruined, slowly moved back south of the Line. The great wheat drive had well and truly run its course. Some farmers converted their holdings into long-term low rental leases and hoped for better seasons. Exceptionally good rains fell once more in 1889 giving much needed hope to farmers who had survived until that time. Above average rainfall was recorded for a few years in some isolated areas and even floods in others. Some good crops appeared but locusts and rabbits ate most of it. A good example of the hardships suffered by farmers at this time is provided by the Borgas Family. In 1899 the Hill family from Hawker began wheat growing in Wilpena Pound and remained there until 1914 when they were forced out, not by drought but floods. By the 1920s most farmers had come to realise that wheat growing in the Flinders Ranges was not the best way to make a living. Well beyond Goyder's Line, Bruce and its surrounding area did have some successful harvests. It wasn't always dry. The area did have rain sometimes and even its occasional floods as well. In March 1921 one of the northern newspapers reported that 'An official who returned last night from the scene of the Willochra floods, states the scene is beyond description. The northern abutment of the Bruce bridge is washed away, and the end of the bridge has dropped'. Floods and washaways like these would occur many times before the railway was finally closed after the completion of a new standard gauge line via Tarcoola to Alice Springs. Farming outside Goyder's Line is still very risky, but also inviting, especially after good rains. In the early 1980s Brenton Byerlee of Eurelia tried it once again. In doing so he became South Australia's northernmost farmer.